Media students from The Sixth Form College, Solihull went to a documentary screening at the cinema recently and got the unique opportunity for a Question and Answer session with the director and writer. 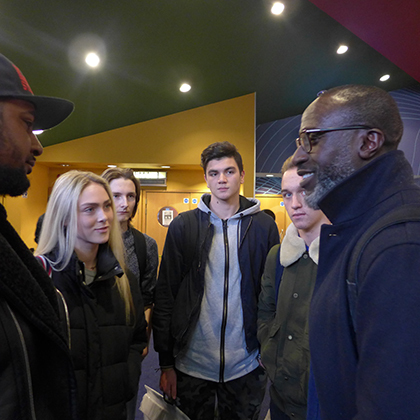 As part of their A Level Media Studies course, students went to see the documentary ‘The Hard Stop’, which was screened during National Schools Film Week last month. The film is about the events that led to the riots across the UK in 2011, following the death of Mark Duggan. This professional film helped students focus on key theories for their written examination and also provided them with some ideas for their coursework. There was also an opportunity to participate in a short Question and Answer session with the director and writer of the documentary, George Amponsah (Writer and Director) and Dionne Walker (Writer). Student James Leatham asked the writer and director, George Amponash if he had made this documentary with a biased viewpoint? The director replied that they had endeavoured to show the true side of the story which had not been as publicly broadcasted as the police point of view and that the documentary was the unheard story about what they believed happened to Mark Duggan.